I am Super Bowl obsessed. We are throwing a small party at the house and I can’t wait to have everyone there, hollering at the television and eating and drinking inordinate amounts of food and beer. And cocktails. Time to start thinking about the decor. Hmmm…what to do? Come on in for decorating ideas. This is my fantasy centerpiece for Super Bowl. With all the calories removed, of course. 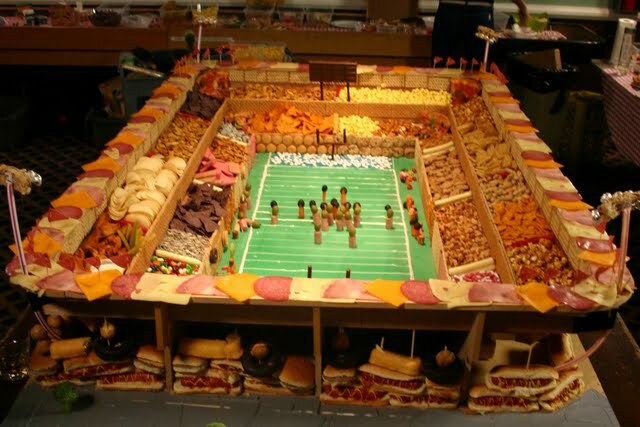 What are you serving at your Super Bowl soiree? How was your Super Bowl Sunday? Did you party with all your favorites and holler at the television? Good, that’s the American way. Me, too. And I have a bit of clean up to do before I can report back on the activities and yummy goodies everyone brought, so here’s a fun video Barry and I made with a super easy recipe for a ridiculously delicious pie for your sweetie on Valentine’s Day. FFF-Are You Ready For Some Football? Whooo Hooo! It is Super Bowl Weekend! Second only to Christmas and the Academy Awards (Feb. 27, if you were wondering). The most fun time for everyone to get together, eat, drink and holler at the television. Everyone is coming to our house this year and we have asked everyone to bring an appetizer to share and some booze. You need booze for a good Super Bowl party. Just ask Don Draper. Or, you could ask our resident NYC party-girl-about-town, Esther, who is always coming up with the tastiest cocktails. This time they are hilariously named after players from both the Packers and the Steelers. Just in time for Sunday. If you live in Georgia, please remember to buy your libations on Saturday. When are they going to lift these blue laws already? Whip up some cocktails with me inside! I have been on a crusade to save money recently. And I bet you might be, too. Let’s help each other, shall we? There are more than a few websites and blogs that specialize in just this thing. One site I found recently that I have fallen in love with is “Budget Bytes” written by an adorable blogger named Beth. So it is “Beth’s Budget Bytes”! She dissects each recipe and tells you how much each ingredient costs and it all looks mouthwatering. I am making one of her dishes tonight but I am surprising Eric so I will share it with you tomorrow. My sweet friend Aimee is the author of the blog “The Coupon Diva“, another amazing way to watch your pennies. She works very hard to bring you the best deals, so go check her out. For flat out fun and all out hilarity, visit my friend Susan at her blog “The Frugal Hostess” – she is a hoot and has some wonderful ideas to boot. Hey, that rhymes! What am I doing to save? Well, I am certainly throwing more interactive parties. We really debated over having a Super Bowl party, and decided to invite everyone over to share their favorite football watching snack, bring their own beverages and we will rev up the Pop Corn Machine (did I tell you about the POP CORN MACHINE? We bought it for a song at a yard sale. In fact, when they told us the price, Eric and I just howled because it was exactly the amount of money we brought to the yard sale. To the penny. And it is the big kind – like at the movie theatre. So now my house always smells like pop corn. But that’s not a bad thing.) We will whip up another snack or two to share and we will open our home. Because that’s what matters – having everyone together. Not how much you spend. If you treat each guest like royalty and greet them with a huge smile and a hug, they will always be happy to contribute. And if they don’t – well, you don’t want them in your home anyway, now do you? Please share your money saving tips with me! I imagine many of you will be throwing parties this weekend for what is, for the most part, a national holiday – Super Bowl Sunday. The commercials are the draw for me. But the game can be fun to watch, too. What’s the key thing for the day, though? Let’s say it together, shall we? The FOOD, of course! Your crew has already tried the wings, the take out pizza, the onion dip out of a container. How about switching it up a bit this year? I am going to give you some recipes that will make you look like the star I know you are – and easy! Because no one wants to be stuck in the kitchen when the party is in the living room, right? 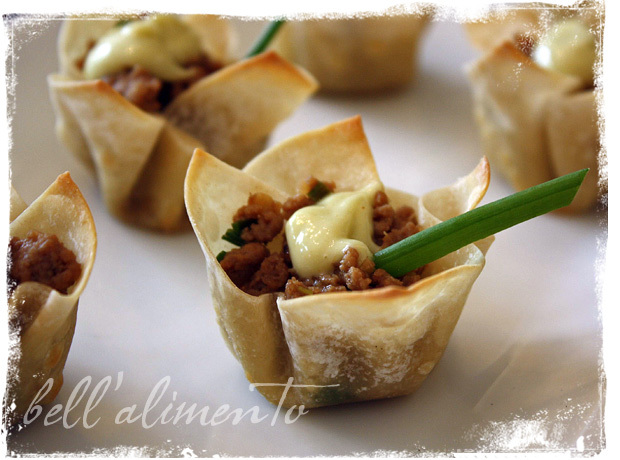 To Learn How To Make These….